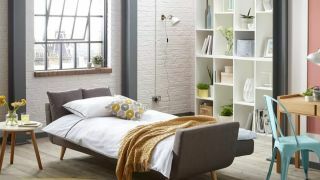 When you think of a sofa bed you may have bad memories of a terrible night’s sleep round a mates house, or a worse for wear piece of furniture that looks like it’s been gathering dust for half a century in an old hotel room. But today, sofa beds have had a total revamp and the best sofa beds are now both stylish, functional, comfortable and most importantly- easy to assemble! What about our list of the best armchairs for your living space? There are a few different types of sofa bed on the market, so we’re here to give you a quick brief about what’s available so you can decide what the best sofa bed is for you. Folding or lift and pull sofa beds are some of the most common and easiest to use, making them perfect for spare rooms where you expect to have frequent guests stay. Other styles include a Clic Clac sofa bed and a frame sofa bed, both of which open out in one simple motion, making them ideal for living rooms where you want to quickly transform the area into a place for guests to sleep. You can even get corner sofa beds so you don’t have to compromise on your preferred living space furniture in order to have a futon. There are a range of designs and styles available, so make sure you shop around for a frame that suits your décor and that you’re happy with as both a sofa and a bed, and don’t forget to double check the dimensions when folded and unfolded to ensure you have enough room for both lounging and sleeping. This corner sofa bed is ideal for bigger lounges and opens out in one easy motion; perfect for impromptu visitors or sleepovers. The grey colour is trendy and stylish and would suit many neutral décors. You also get three yellow cushions included which complete the look nicely. You won’t have to worry about getting this sofa bed through the front door as it comes in three parts which are easy to assemble at home. This wooden and fabric large 2 seater sofa is ideal for a spare room or would also look good in a room such as the conservatory. This futon comes in three different neutral colours and easily folds out into a comfy bed with foam mattress. It also has a handy shelf on the side for storing things such as reading material, and there is enough space to store other items under the sofa itself if you wish. This is a modern futon that would be perfect for your lounge or office space to use for when you have guests over. Some users say the sofa is a little firm but others like this for sleeping comfortably on. When used as a sofa it is designed for three people but has also been said to fit as many as 4 or even 5 comfortably. The three neutral colours would look great in any modern home. For a simple sofa bed that looks great you can’t go wrong with the Palmer Sofa Bed. It is a clic-clac mechanism which means it folds out in one movement into a small double bed and won’t take up too much space in your living area. You also have the option to add cushions with your purchase which add extra style to this contemporary futon. This super cosy futon looks like a normal sofa and provides the utmost comfort for both lounging and sleeping. The best thing about this sofa bed is that it comes in a wide selection of colours which means you’re bound to find one to suit your décor perfectly and it is spacious enough to sleep two people on its spongy foam mattress. This modern sofa bed with stainless steel frame is perfect for modern apartments and would make a great addition to an office or even in your bedroom for extra sleeping space. Its clic-clac motion means it folds out with minimal effort, and although very basic, it is surprisingly comfy with its foam filled spongy mattress. This won’t take up too much room so is ideal for smaller households and the charcoal and beige colours suit most décors. Take a look over at Real Homes to find the best cushions to complement your new sofa bed!